Magneti Marelli Automotive Lighting’s “E-Light” LED low-beam module allows simultaneous savings in energy and fuel consumption, with superior lighting performance to the benefit of motorists. E-Light uses about 1/6 of the energy of a traditional halogen light bulb. This solution guarantees those carmakers that fit the E-Light a bonus of 1 g CO2/km per vehicle, allowing considerable potential savings on the strict sanctions set for automobile manufacturers by European regulations on vehicle emissions. The Official Journal of the European Union has announced the official decision taken by the European Commission of including in the list of “Eco-innovations” envisaged by Law (EC) No. 443/2009 of the European Parliament, the LED low beam lighting module called “E-Light” developed by Magneti Marelli Automotive Lighting. The technology offered by Automotive Lighting, the Magneti Marelli business line dedicated to lighting products for the automotive market, is thus officially acknowledged as being innovative and effective in cutting down CO2 emissions by automobiles, an objective sanctioned by European regulations. The “E-Light” LED low-beam module ensures certified energy savings, allowing carmakers to obtain a credit of 1 g CO2/km for every vehicle that fits this module in its headlamps. This aspect can potentially result in significant savings for carmakers in case the limits set by the European Union for the average value of CO2 emissions by vehicle fleets are exceeded. In fact, the regulations in force within the EU aim at a gradual reduction in CO2 emissions, starting from a limit of 130 g CO2/km in 2015, down to 95 g CO2/km in 2020, with sanctions applied to each gram over this limit. As from 2012, if the average CO2 emissions of a carmaker’s fleet exceeds the limit value set by the legislator, the carmaker will be required to pay a fine for the excess emissions of each registered vehicle. This fine amounts to € 5 for the first g/km over the limit, € 15 for the second g/km over the limit, € 25 for the third g/km over the limit, up to € 95 for all subsequent g/km over the limit. Starting in 2019, the fine will be increased to € 95 as from the first gram over the limit. In this normative framework, the Eco-Innovations envisaged by the EU are a specific category of technologies that provide a confirmed contribution in terms of reducing CO2 emissions, certified by third-party bodies and verified in real life and in the actual road use of the vehicle (consequently outside the official type-approval cycle of the vehicle). According to the regulations sanctioned by the European Commission, all carmakers, upon request, can benefit from a credit of up to a maximum of 7 g/CO2 if they adopt approved and certified Eco-Innovations on each vehicle. The E-Light module made by Magneti Marelli was precisely recognized by the European Commission to contribute to reducing CO2 emissions by about 1 g/km during actual vehicle use. The innovative content of the “E-light” LED low beam module lies in the advanced use of light refraction/reflection techniques through the use of lens that concentrate, in an extremely effective way, the light beam generated by a limited number of light diode sources (LEDs). During the analysis and certification phase of this solution, the term of comparison used to prove the efficacy of E-Light in reducing emissions was the halogen light bulb. Even when compared to the power in watts, the difference is quite clear: the E-Light LED low beam uses up 11 watts compared to the 68 watts of a regular halogen low beam light bulb, with superior performance in terms of lighting power. E-Light can be applied to newly developed models of cars currently in existence, and the credit of 1g CO2/km will be acknowledged for the specific model that adopts the solution as from the design phase, for greater flexibility in vehicle design from the standpoint of CO2 emissions. “The decision taken by the European Commission is very important for us - commented Eugenio Razelli, C.E.O. of Magneti Marelli - because it actually confirms the efficacy of the advanced LED lighting technology developed by Magneti Marelli Automotive Lighting, within the scope of the stringent regulatory framework for the reduction of vehicle CO2 emissions as of 2020”. “The E-Light, recently acknowledged as an Eco-Innovation by the EU - continues Razelli - is the classic “win-win” solution: it benefits the carmakers by allowing them to potentially save on CO2 levels emitted by their fleet, and it is also interesting in terms of the final customer, specifically from the standpoint of safety, reliability and reduced consumption, as well as design. LED technology is revolutionizing the world of lighting, not only in the automotive sector. Adopting this technology on automobiles requires the ability to add LEDs to the automobile system and associate them to electronics in order to optimize their operation. The use of traditional halogen lamps will gradually decrease on automobiles too: they are already gone from some of the top-of-the-range full-LED headlamps, replaced by luminous diodes arranged in a matrix and electronically activated”. Magneti Marelli’s Automotive Lighting division develops technologically advanced lighting solutions for the automotive market. The technological evolution that derives from LED and Xenon technologies – with the 35-Watt configuration as well as with the new, highly competitive 25-Watt solution – has opened up new frontiers in the area of safety and reduction of energy consumption and CO2 emissions, at the same time offering new possibilities in terms of look and design. The most recent solutions in the lighting area in terms of technological content are the “full-LED” solutions for headlamps, with all lighting functions carried out through LED technology. Specifically, the adaptive full-LED light matrix headlamp is proof of how electronics is increasingly changing lighting technologies too. The development line, in particular for adaptive LED lighting, requires for all the mechanical functions involved in pointing the light beam to be gradually replaced by electronic functions capable of controlling the direction of the beam and the luminous intensity of the LEDs. Automotive Lighting is already producing completely electronic full-LED headlamps. Some of Automotive Lighting’s main innovations in the technological evolution of this sector have been the introduction on the market of the first Xenon headlamps in 1991, the Xenon dynamic curve light in 2003, and the first headlamps with active infrared module in 2005. Undertaking a veritable revolution in lighting technology, in 2008 Automotive Lighting launched the mass production of the world’s first full-LED headlamp (for the Audi R8), with all lighting functions carried out by LED light sources. 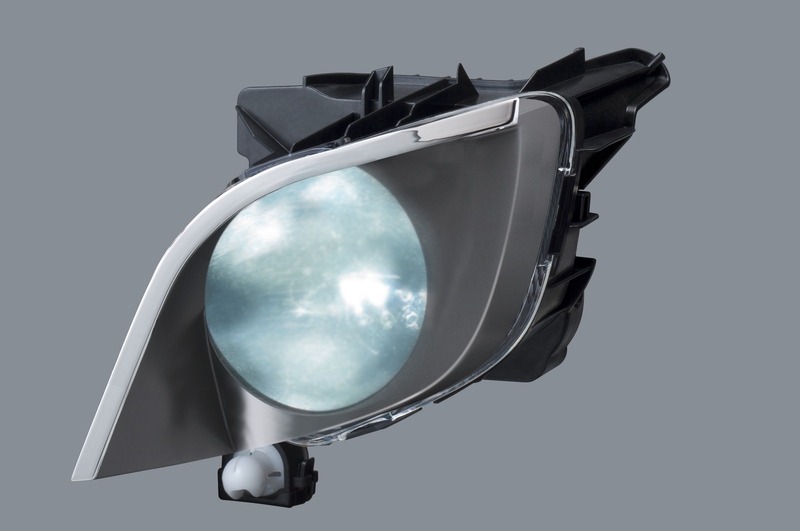 Then came the world’s first headlamp equipped with active night vision system with infrared rays and, in 2010, the first full-LED headlamp with adaptive function (for the Mercedes Benz CLS). With a turnover that accounts for over € 2 billion of Magneti Marelli’s total turnover of € 6 billion, and an annual production of approximately 22 million headlamps and 22 million rear lights, Automotive Lighting represents one of the main areas of Magneti Marelli’s business perimeter, as well as one of the major players at the global level in the lighting sector. Automotive lighting is present worldwide, with twenty-three facilities located in fifteen countries, in close contact with its customers: Brazil, Czech Republic, China, France, Germany, Japan, India, Italy, Malaysia, Mexico, Poland, Russia, Spain, Turkey and the U.S. Its Research & Development centres, focused on innovation, are located in Europe (Germany and Italy) and in the United States.